As a drop from the "nose" of Jutland lies the peninsula Mols along the southside of Djursland. The landscape on Mols is very hilly due to material pushed up by glaciers during the last ice age. The soils are very mixed with large areas of sand but also more clayey soils can be seen. The picture is taken from one of the highest hills on Mols app. 140 m over sea level. 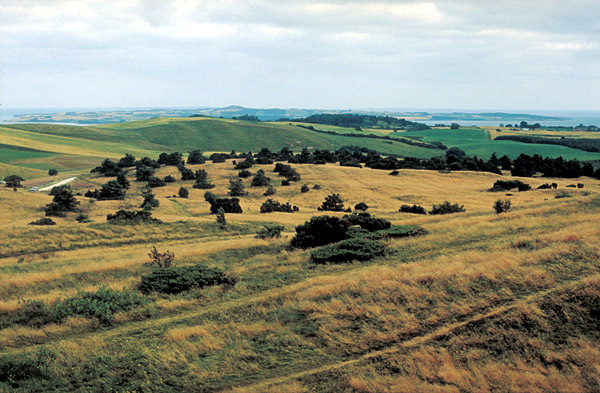 One can see grassland and fields but in many places there are heath and juniper-slopes. This beautifull and varied landscape is protected and now a part of the Natura 2000 network. The coast along Mols is very varied with high slopes and flat stretches with salt marshes.